Pioneers in the industry, we offer veterinary liver tonic from India. 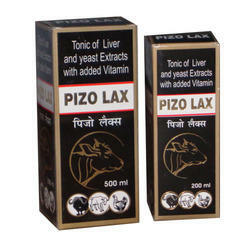 We are offering wide range of Veterinary Liver Tonic (Pizo Lax) to our valued clients, These are accurately formulated using quality ingredients to ensure effectiveness and exact composition. We offer our range of Veterinary Tonic at most affordable prices. Vitamin B 1 5 mg.
Vitamin B1 2 7.5 mg.
Store at a temperature not exceding 30°C. 20 ml daily for 10 days. 40 ml daily for 3-5 days. 5-10 ml daily, or as directed by the veterinarian. Looking for Veterinary Liver Tonic ?